Audio components from Spectral have evolved for decades with a continuous research program that includes auditioning live music at recording sessions and careful listening trials though a variety of reference sound systems. The knowledge from this work has become an essential part of creating and evaluating promising technical concepts, new circuits and testing methods. The very best candidates, those with greatest potential to preserve a live music experience become parts of Spectral technology used to create new stateof-the-art audio products. This background work has substantiated the benefits of new semiconductors manufactured with recently developed manufacturing processes and their inclusion to make hybrid surface mount and through-hole amplifying circuits with exceptional performance. Our laboratory tests that correlate to human hearing and use music-like waveforms verify their technical advantage. The most promising circuits, those accurately conveying robust dynamics and transparency along with superlative detail and staging have become part of Spectral design and creation of some of the world's finest audio amplifiers. 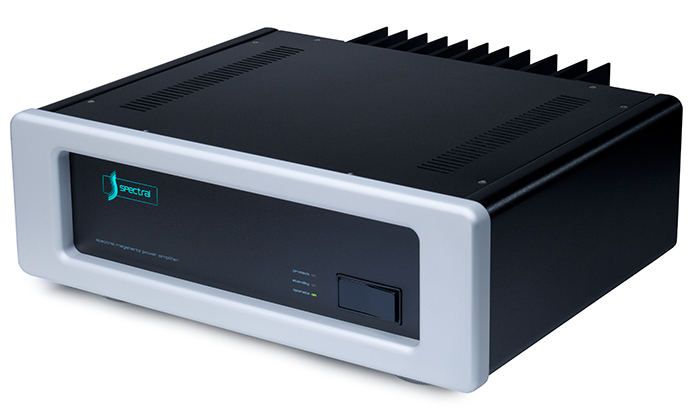 Now Spectral introduces the DMA-240 Reference Amplifier, an exceptionally fine new stereo amplifier which combines superlative musical performance and remarkable value. In developing new and advanced amplifier topologies, we are constantly researching available semiconductor transistors for premium devices which will be superior in Spectral high-speed analog applications, including a new generation of SMT transistors. Many of these surface mount semiconductors we could use for new designs have quicker responses and possess excellent amplification potential, yet their inclusion into carefully designed Spectral circuits would not live up to our expectations. Many were found to damage resolution and clarity. We believed that perhaps thermal stress and charge settling might be responsible since electronic evolution has favored smaller semiconductors whose junctions might respond to transient heating and produce thermally active errors. To explore this possibility we developed new sophisticated sampling tests at Spectral using simulated music waveforms to screen promising new semiconductor devices. A typical evaluation would create isolated transient events at semiconductor junctions so that heating would be similar to that from amplifying music and correction responses expected from loudspeaker loads. Such events require responses that demand brief energy bursts, which produce quick temperature surges. Then junction voltages, which should be constant might change to memorialize the event and to initiate error responses or thermal tails. Since most integrated circuit op-amp amplifiers have similar difficulties, the test methodology was made practical from working with these consumer devices. Performance limits became quantified to hearing acuity as well as human perceptual ability. These new test methodologies have now consistently verified the Spectral philosophy of inherently fast - low stress amplification to achieve ultimate resolution and accuracy. When instantaneous waveform accuracy is achieved at parts-per-million, the listening experience can become most detailed, transparent and involving. Our search for superior amplification devices led us to recent discrete semiconductors intended for premium television and computer displays. Their hefty construction and advanced manufacturing processes create a substantial and very fast device that is free of thermal tail and memorialization of error issues. These new devices can operated over a wide range of voltages and currents while being capable of excellent gain linearity, quickness and ability to amplifiy very high frequencies. The DMA-240 achieves its remarkable clarity and resolution from a combination of these breakthrough performances. In the course of development work for our amplifiers, many different semiconductor technologies and manufacturing processes have been researched. Most promising were those featuring breakthrough manufacturing processes and computed chip geometries that produced excellent tests from both traditional tone tests and our recently developed music related test methodology. Best examples from this work often spawned unique or new circuits whose design integration required computed "re-designs" that would change many resistors and capacitors in the test amplifier. Each experiment might include new JFET, CMOS or Bipolar devices, but unlike traditional parts swapping, the test platform would be a well thought out optimum design prototype that could be realistically compared to a highly evolved Spectral reference component. The result of this research effort is the Spectral High-speed Hybrid Amplifier driver module, and ideally optimised topology using the finest available transistors from both SMT and traditional leaded components technologies. are essential to fully utilize the new faster devices that have been successfully tested. The SHHA driver module provides greater parts density where needed and its layouts have become more purposeful than our previous drivers. Exemplary staging and quiet amplification are hallmarks of this technology as left and right channels are extremely well isolated and free of interferences. Inherent miniaturization makes room for more and better support circuits used to regulate the amplifier, its voltages and currents, as well as to cancel magnetic fields and block electrostatic interactions that might propagate from signal, power and speaker cables. All Spectral amplifiers employ similar environmental isolation strategies, but additional fine-tuning from the SHHA surface mount hybrid technology greatly improves this ability. It also provides tight thermal coupling to evenly distribute temperatures allowing higher biasing currents that improve dynamic headroom. The important gain path from microvolt sensitive JFET devices to the powerful compact MOSFET output section is now direct and clean for effortless amplification. All combined, the new hybrid surface mount construction and advanced active devices of the SHHA driver improve accuracy, speed, power capability and provide greater stability margins that are necessary for supporting the D MA-240 'Focused Array' high-speed, high-current output. waveform or time sense, the output signal from the DMA-240 traverses from point "A" to "B" of a musical event with exactly the same waveform shape as its input signal. It does this with parts-per-million accuracy that is free of memorialized unnatural artifacts either before or after the input event. This requires extreme precision. Because Spectral circuits have intrinsic speed and acccuracy. the amplification from the DMA-240 is stress free and precise and this important performance aspect preserves clarity, transparency and resolution. the lowest distortion levels attained in an audio amplifier. The DMA-240 Reference Amplifier achieves the long sought after ideal of 'instantaneous amplifier accuracy' with virtually no signal memory to combine superlative musical performance with exceptional value. - State-of-the -art instrumentation amplifier. - 3rd generation high resolution design. - Ultra fast settling circuit architecture. - High speed design with high current capability. - Ultra precision RF type layout and topology. - Focused Array high-speed aligned fet output section. - SHHA high-speed hybrid driver module featuring exclusive •m1aodetailing" circuit tuning. - Power Vault magnetic field containment system. - New generation vertical mos-fet output transistors with innovative servo-bias tracking system. - Non-invasive optical and thermal protection circuits. - Fully discrete design with dual monaural operation. - All modular construction with instrumentation connectors.